I can’t help but wonder what the high-school version of myself would have thought of this unexpected twist. 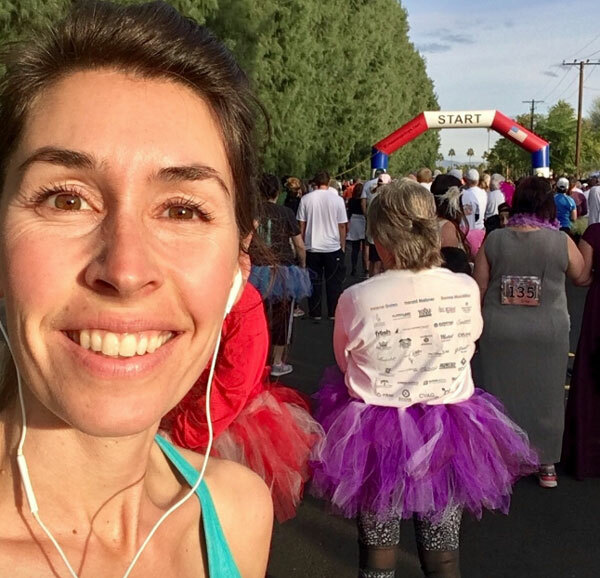 I–the girl who saw no logic in running unless it was from something dangerous or toward home plate–is about to run 5 Kilometers for the pure challenge of it. As the announcer signals the start of the race, music pours forth from the suspended speakers and the spectators shower their support over us like refreshing rain. The festive atmosphere is accentuated by the Red Carpet Film Festival race theme. It becomes immediately apparent that my beach training did nothing to prepare me for the distraction of runners in Red Carpet Hollywood-esque costumes. 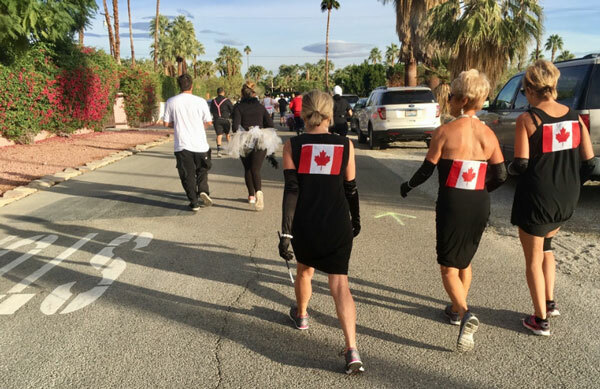 I try to keep my pace consistent while I pull out my phone to snap a photo of three classy ladies in black cocktail dresses sporting Canadian Flags. Next, I spot a woman in a golden, floor length dress and fairy wings. Moments later I receive a text from a friend saying, “Goooooooooooooooooo!!!! !” and I respond with a selfie photo showing my compliance to her command. Next, I decide some running music is in order. Realizing that I’ve not previously prepared for this, I’m now simultaneously running and scrolling through Amazon Prime music searching for a suitable station. 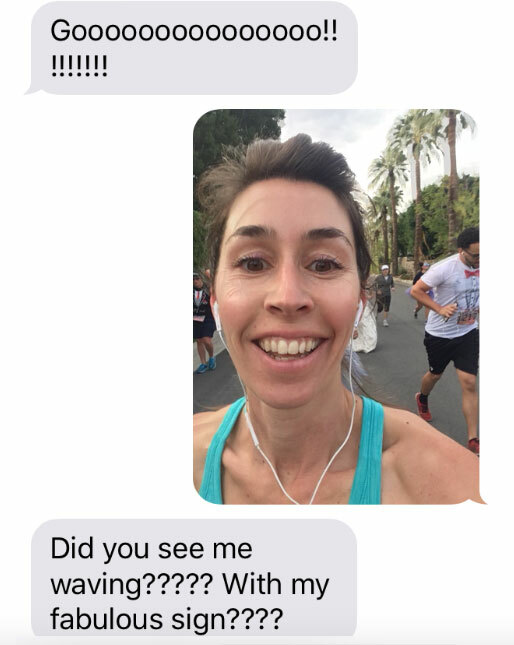 Around this time I notice that I am breathing harder than typical at this point in my run and surmise that multi-tasking a 5K race while taking photos, sending selfies to friends, and searching for music was definitely not part of my training regimen. As I pass mile 1 with a pace several minutes faster than my training, I make peace with the fact that my goal to run the race without stopping will soon require a true test of will. As the hill crests and slopes downward, my strength is rekindled and I allow gravity to pull me into its swift embrace. My pace overtakes an older gentleman and as I adjust my stride to match his, we exchange breathless pleasantries which quickly digress into his discouraged outlook on the race. 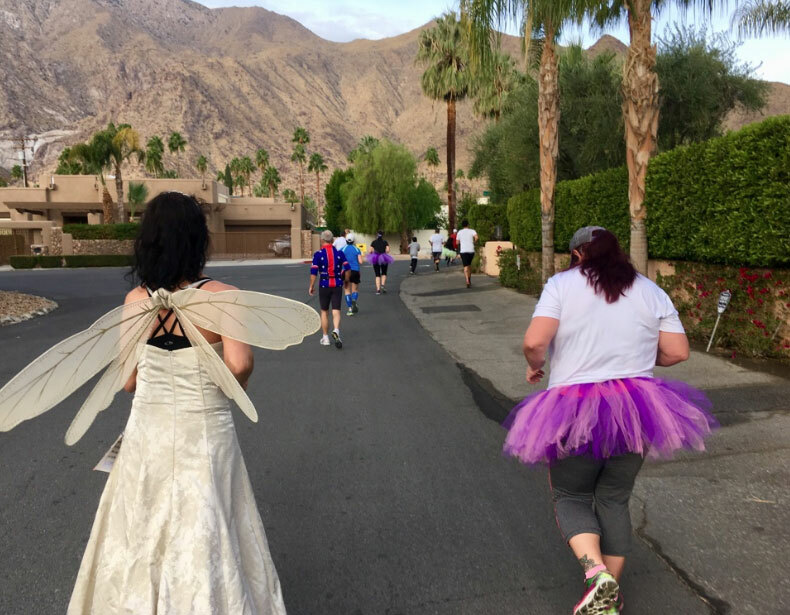 “I’ve been passed by a woman wearing a dress and wings and a mom with a child on her hips!” While I haven’t seen the hip-mom, I know exactly which winged woman he is speaking of–I’ve been trailing in her rearview mirror for most of the race. We wish each other luck and I pull ahead with a new perspective. While I’ve been tailing Mrs. Golden Fairy Wings, encouraged by her endless endurance, Mr. Discouragement got trapped in comparing himself to the performance of others and determining his value based on the results of that scale. I’m struck by the contrast of these two points of view and challenged to evaluate my heart in this area. Am I more prone to compare myself to the success of others as a means of evaluating my worth or to use the accomplishments of those around me as an encouragement to strive toward my own personal best? It’s easy to lean toward comparison but it’s a self-sabotaging endeavor. As the finish line approaches, I am amused by a runner with two dogs on a leash. At this point in the race, having two large dogs to help pull me toward the finish line sounds like a great strategy for success. However, no sooner does that thought process, than Mrs. Doggie Owner’s run is waylaid while her pooch poops on the side of the road. 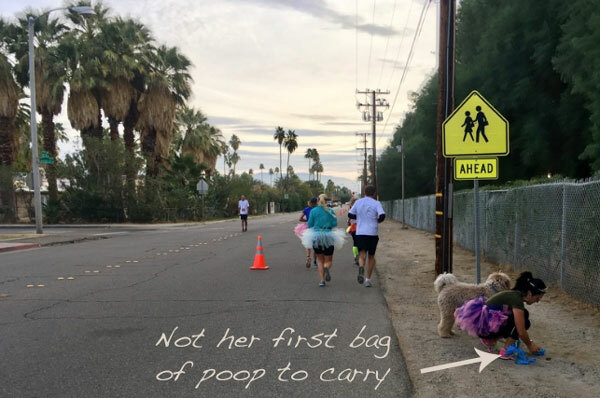 She bags the excrement and continues her run with the bagged poop in tow. I can see them waving. My kids, shifting from foot to foot in excited anticipation, waiting to greet me at the finish line. I’m tired. I’ve pushed myself hard. My body is begging me to stop running but I force it to obey. Each stride brings me one step closer to completion. At this moment I’m not focused on Mrs. Golden Fairy Wings or even Mrs. Doggie Owner. 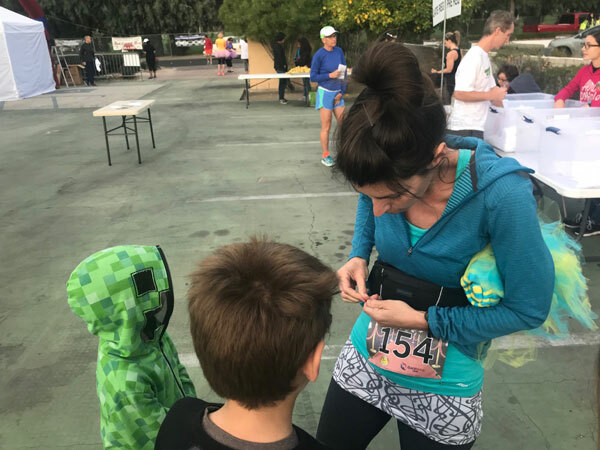 I’m thinking about last October when I decided to begin training for this race and I’m looking ahead at those little hands waving me toward my goal. I’m focused on the path set out before me and I am running–not from something dangerous or toward home plate–but just for the pure challenge of it. P.S. WAS IT WORTH IT? 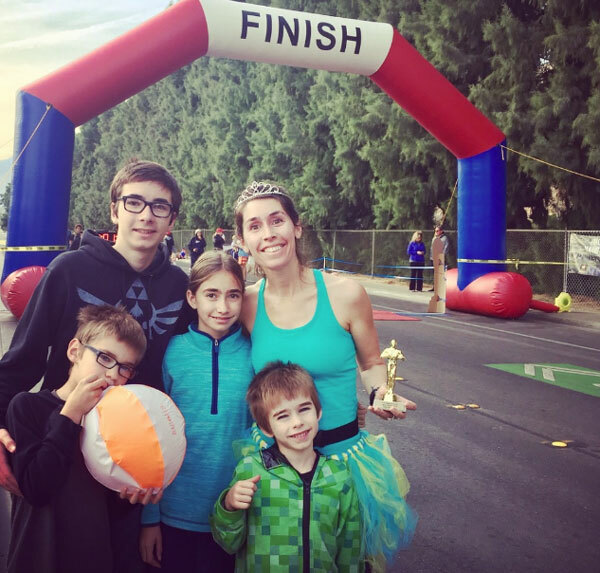 After the race, a friend asked me if it was worth it–the training, entry fee, getting up early, driving an hour to the race location all to run side-by-side with strangers. Yes. It was worth it. Because when I challenge myself to do something which requires more of me than I have previously given, I learn more about what I am actually capable of achieving. If at 39 years of age I can still be in a place of self-discovery, than I have even more interest in finding out who I will be next year. How about you? Are you more prone to compare yourself to the success of others as a means of evaluating your self worth or to use the accomplishments of those around you as an encouragement to strive toward your own personal best? Have you done anything for the pure challenge of it lately? Tell me what it was! Having or showing keen mental discernment and good judgment; shrewd: I’ve never done this before and the concept still seems to lack a sense of sagacious forethought. **This analogy has some obvious flaws. Mrs. Doggie Owner probably was fulfilling her primary purpose in having a fun run with her cute dogs. Nevertheless, I couldn’t help but draw connections from her actions to the thoughts I was processing in my head. Way to go, Heather! I am proud of you. And I very much appreciate having you in my life. You inspire me to be in a place of self-discovery, moving forward, overcoming challenges, at every age of life. I look forward to 2019 Heather too! Great verse! It would have been a real treat to have you running by my side but I treasure your support and am so glad I can call you friend! You did promise to make us feel like we were there! You fullfilled that promise and then some! Selfies on the race route!?!?!?!?! And as always, the thought-provoking questions and observations pierce deep into our hearts to evaluate ourselves! Looking forward to many more opportunities to be spurred on by your sweet self to be a better me and a better testimony of Him inside of me! Thank you sweet friend. I am so glad I have can call you friend and that we have had time to be together these last few months! Good food for thought Heather! And congratulations! So sweet to have your family cheering you on! As for myself I try not to compare myself with others and look for inspiration instead or I do love to encourage others when I see an opportunity.. I am always setting up new challenges for myself and am always pleased if I can do better than I did last time. So I try to compare me with former me. And if I don’t quite make it, to still be proud of the courage to try! Congrats again and a well written piece.